Mesa ETP RESIST-ALL-CLAD® Flexible Floating Roof Drain systems ensure drainage of water from the Aboveground Storage Tank’s floating roof. 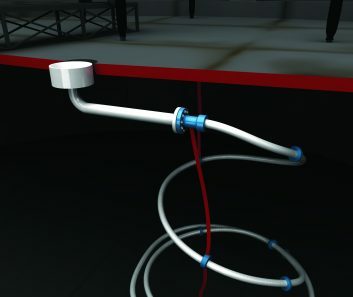 Mesa ETP Flexible Floating Roof Drain systems are designed to suit customer tank dimensions and rain fall data. RESIST-ALL-CLAD® Flexible Pipe is designed for continuous service (both externally and internally) in a wide range of pH solutions and chemicals. It is completely compatible with pure M.T.B.E., 100% aromatic hydrocarbons (Benzene and Toluene), pure alcohol, gasoline and jet fuels. RESIST-ALL-CLAD® Flexible Pipe features a fully controlled, repetitive lay pattern (multiple coil). RESIST-ALL-CLAD® features a tether system that keeps the drain in position as installed. Tethers are attached to the underside of the floating roof and between ballasts on the flexible pipe. RESIST-ALL-CLAD® flexible floating roof drain assemblies offer a service life expectancy of up to 20 years provided the system is sized, installed and operated in the intended/designed manner. 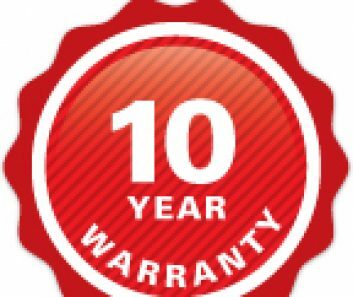 All Mesa ETP flexible floating roof drain hose assemblies come with a 10 year limited warranty. RESIST-ALL-CLAD® features a smooth internal fluidway offering fast flow rates and efficient drainage from the floating roof. It does not include internal corrugation, which could trap sediment or cause flow restricting turbulence. Full-flow steel fittings are protected by thick nylon coating (inside and out) to prevent corrosion. Floating 150 lb. ANSI raised face flanges are standard. All-stainless steel hardware and tether fittings are available for high pH applications. RESIST-ALL-CLAD® Flexible Pipe has negative buoyancy in all storage products, including light chemicals and heavy crude oil. RESIST-ALL-CLAD® utilizes a multiple-coil design to provide a fully preformed, controlled and repetitive lay pattern that does not slide on the tank floor. 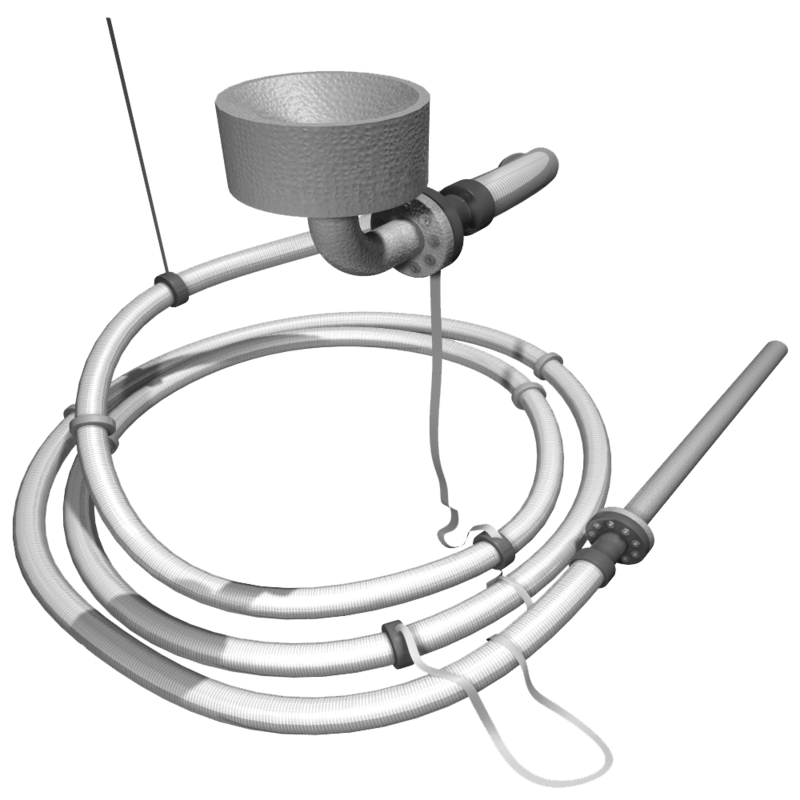 The tether system ensures the coils do not stray from the designed installation pattern. RESIST-ALL-CLAD® is most commonly used to drain water from the floating roof as part of a flexible floating roof drain system in an aboveground storage tank. RESIST-ALL-CLAD® is also used in flexible skimmer systems (used to drain a light liquid product from a tank) and foam delivery systems (used to distribute foam around the storage tank’s rim area). 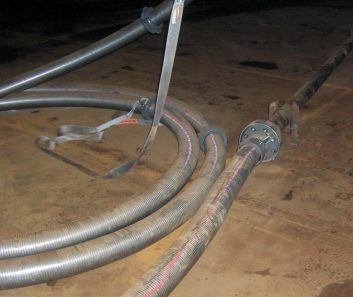 The flexible pipe’s stainless steel armor provides external protection and very low coefficient of friction. RESIST-ALL-CLAD® Flexible Pipe is engineered in a custom length, size and configuration to ensure optimal performance and long service life. Achieving a successful installation of RESIST-ALL-CLAD® flexible pipe involves the following procedures: tank measurements and relevant information are recorded on the roof drain data sheet. Mesa ETP engineers analyze the data sheet information and provide an “AST Drawing” detailing the layout of the flexible pipe within the tank. Mesa ETP ships the RESIST-ALL-CLAD® with AST Drawing, installation instructions and additional documentation. 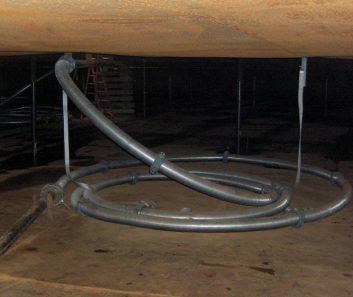 Customer installs the flexible pipe according to the AST Drawing by following Mesa ETP RESIST-ALL-CLAD® installation instructions. Mesa ETP sends a field engineer to supervise all RESIST-ALL-CLAD® installations to ensure procedures are followed and to guarantee the proper installation.